Dragonflight chronicles the story of Lessa, the sole survivor of the noble ruling family of Ruatha Hold on the northern continent of Pern. 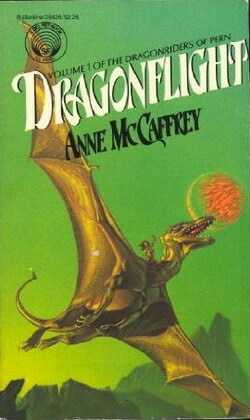 When the rest of her family is killed by a cruel usurper, Fax, she survives by disguising herself as a drudge (a menial servant), partly through simply adopting a slovenly appearance, but also by using her hereditary telepathic abilities to make others see her as far older and less attractive than she actually is. Her only friend is a watch-wher, a somewhat telepathic animal (related to dragons) that guards the hold. Lessa psychically influences other Hold workers to do less than their best work, or to become clumsy or inefficient, in order to sabotage Ruatha as part of her strategy to make Ruatha economically unproductive, so that Fax will renounce it and she can retake her hold. F'lar, wingleader at Benden Weyr and rider of the bronze dragon Mnementh, finds Lessa while Searching for candidates to Impress a new queen dragon, as the current queen has a batch of eggs due to hatch very soon, including a crucial golden egg. After killing Fax in single combat (following the rules of the Pernese code duello), he realises that she emotionally manipulated him to kill Fax and engineered Fax's renouncement. It is then that F'lar recognizes Lessa as possessing both unusually strong psychic abilities and great strength of will. He recognizes Lessa's capacity to be the strongest Weyrwoman in recent history, and potentially the path to his own leadership at Benden Weyr. F'lar convinces a reluctant Lessa to give up her birthright as Lord Holder of Ruatha Hold for the larger domain of the dragonweyr and she agree to pass the title on to Fax's newborn son (who later features in The White Dragon). F'lar takes Lessa to Benden Weyr, where she Impresses the queen hatchling Ramoth and becomes the Weyrwoman, the new co-leader of the last active Weyr. On Ramoth's first mating flight, Mnementh catches her, and by Weyr tradition, this makes F'lar the Weyrleader. One Weyr by itself is not enough to defend the planet; there used to be six, but the other five Weyrs are now empty, deserted since the last Pass centuries before. In a desperate attempt to increase their numbers, a new queen, Prideth, and her rider, Kylara, are sent back between times (a recently rediscovered skill) ten turns, to allow Prideth time to mature and reproduce. Lessa travels four hundred turns into the past to bring the five 'missing' Weyrs forward to her present. This is a huge strain for both her and Ramoth. She convinces the dragonriders of the five Weyrs to go with her to their future, and they use the Red Star as a guide to make smaller, less strenuous hops forward in time. This not only provides much needed skilled reinforcements in the battle against Thread, but explains how and why the five Weyrs were abandoned: they came forward in time.